Introduced in ES6 is a new way in which we can create a string, and that is the Template Literal. With it comes new features that allow us more control over dynamic strings in our programs. Gone will be the days of long string concatenation! To create a template literal, instead of ' or " quotes we use the ` character. This will produce a new string, and we can use it in any way we want. Webpack is all the rage these days, but it seems like getting started with Webpack is kind of tough. Let’s take some time to walk through the fundamentals of Webpack and get started by using Webpack with babel to transpile our ES6 code. At the start of the year, I started a little web series called Let’s Learn ES6!. 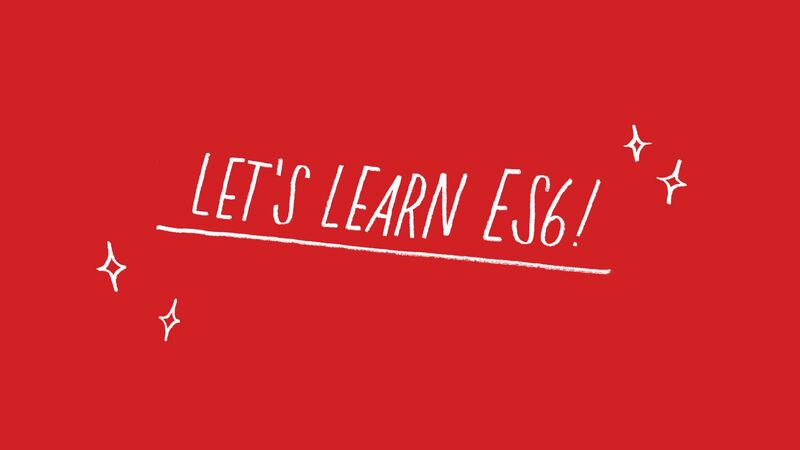 The goal of Let’s Learn ES6 is to make learning the new features fun and accessible. ES6, or ES2015/ECMAScript2015 was approved in June 2015 and browser support for it is really coming along. As of writing this (Feb 2016) Chrome 50 has 91% support for ES6, even Edge 13 has 83% support!! In this video series I want to break down the features in nice little chunks. Each week,on Wednesday, we will explore a new features. Hopefully making learning the new features fun and accessible. At some point we will run out of ES6 features to take a look at, so ultimately I want Let’s Learn to be a broader series on learning new tech with the idea of small focuses lessons in mind! You can find all the videos HERE! Hopefully you enjoy them!